After a long break, spending too much time at work, I decided this weekend to ignore the eyestrain and get my sensor network up and running again. Installed a few years back (actually, 2007 when I look at the logs), I broke it and due to other pressures never got it back up and running again. This weekend, I got it spitting out data again after a bit of cable pruning and software re-writing. 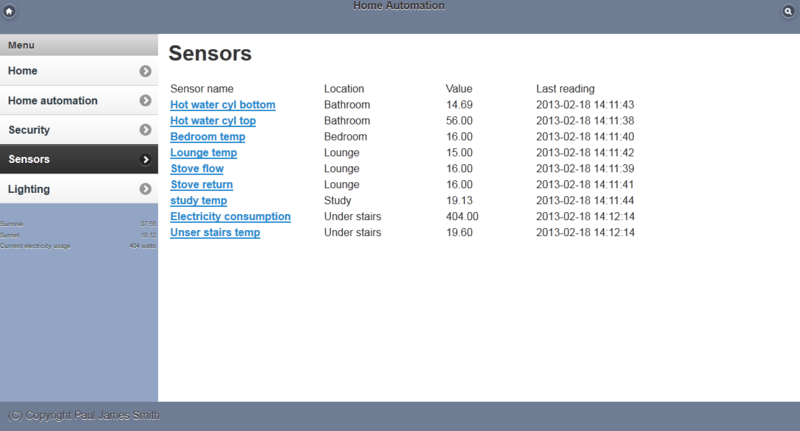 Most of the room temperature sensors are now back online. Electricity usage monitoring is back as well. Most of these sensors are part of a Dallas 1-Wire network and are cabled. Some are Jeenodes, wireless aurduino devices that are battery powered. All the data is queried via a .NET server app. On a roll with the 1-Wire, I decided to re-write and make live the website using most of the same code as a base, but with a new template. This time in ajax and HTML5 with a view to running it as a control interface from tablets, phones, etc. Using jquery mobile, HTML5, and flot for the graphs, it was surprisingly easy. I now have online access to the data, control of the lightwaveRF lighting, and the CCTV via a super touch style tablet interface, from anywhere. Super! More sensors, lightwaverf snooping and the ability to run lightwaverf control sequences are in order. It feels good to get this all back on line and better than before, after such a long absence. The interface, whilst very simple, really is very usable. 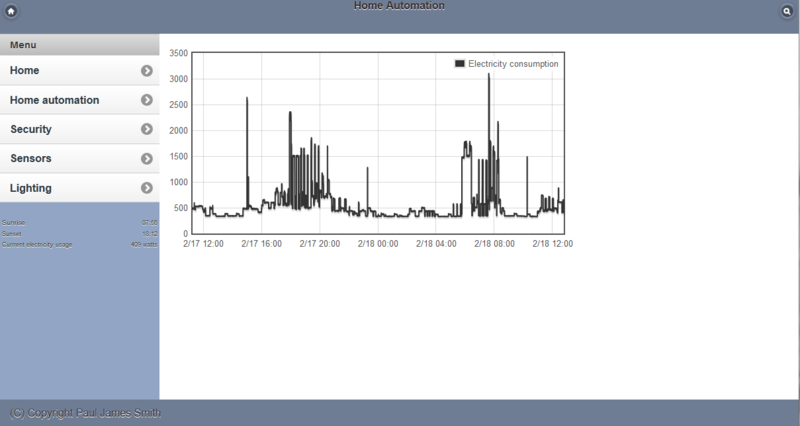 Screen shot of the electricity consumption graph off the sensors page.